Install the airbag connector between the No. 5 heater to register duct and the center bracket temporarily, then install the instrument panel. Remove the airbag connector before installing the lower No. 2 panel. (a) Install the 6 bolts, the 2 nuts and the instrument panel, then connect the connectors. (b) Install the 2 bolts to the front passenger airbag assembly. (c) Connect the junction connectors. Install the front console box and the front console box bracket with the 2 bolts. Connect the connector, then install the center lower cluster finish panel. (a) w/o Disc player changer: Install the rear console box with the 6 bolts and the 8 screws. (b) w/ Disc player changer: Install the rear console box with the 4 bolts and the 8 screws. (a) Install the console rear end panel with the 2 screws. (b) Install the rear console cup holder box. Install the front console panel, then install the transfer shift lever knob. HINT: w/ Navigation System: When removing/installing or replacing EMV, or when disconnecting/ connecting the battery terminal, turn the IG ON and OFF twice for initial display setting. Connect the connectors, then install the center registers. Install the lower No. 2 panel with the 3 screws. 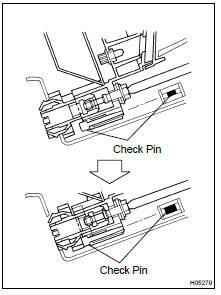 (a) Connect the glove compartment door damper clip, then install the glove compartment door. (a) Check that the set-in connectors are connected securely in the installation holes on the instrument panel. (b) Place the combination meter on the instrument panel. (c) Install the combination meter by tightening the screws, "A", "B" and "C" in order. (d) Tighten the connection bolts. When connection completes, the bolts turns idly, causing turning noise. Check that the connection check pins protrude from the lower side of the connection bolts. NOTICE: Follow the procedures in the order of (c) and (d). Otherwise, set-in connectors on the wire harness side and connectors on the meter side might not be connected properly. Install the No. 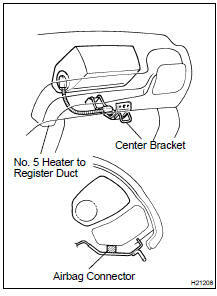 2 heater to register duct with the screw. (a) Install the combination switch with the 4 screws. (b) Install the clamp, then connect the connectors. Install the column covers with the 3 screws. Install the LH lower panel with the 3 bolts. Connect the connector, then install the lower No. 1 panel with the screw. (a) Install the fuel lid control cable lever with the 2 screws. Connect the connecter, then install the cluster finish panel. (a) Install the front pillar garnish. (a) Install the assist grip with the 2 screws, then install the 2 assist grip plugs.